Servals Automation was presented with an award for its Business Model. The award was given by L-Ramp as part of their excellence awards for 2007. L-Ramp specializes in recognizing offering mentoring to innovations that have the potential to transform the lives of under served people. 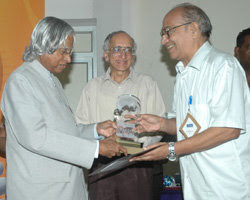 These Excellence Awards were presented by Dr. Abdul Kalam at a function in IIT, Chennai. "Headed by Mr. P. Mukundan, Servals is a Chennai-based company that focuses on developing and marketing energy-saving innovations that benefit the poor. The company’s Venus energy saving burner is robust, cheap, long lasting and has efficiency of up to 30% more than existing burners. The Plant Oil Stove developed by the company offers users a choice to substitute expensive kerosene with locally available plant oil to the extent of about 25%. This is a boon to rural and low income people. Servals has built a viable business for serving the poor and rural consumers."